Students took their first quiz today. I’ve decided to move away from big unit tests in favor of short, frequent assessments. We now have a school-wide policy requiring at least one retake opportunity on all assessments, so I tried to really focus on providing feedback, not grades on the quizzes. It made me feel really optimistic, and I hope my students can find some of the same optimism. 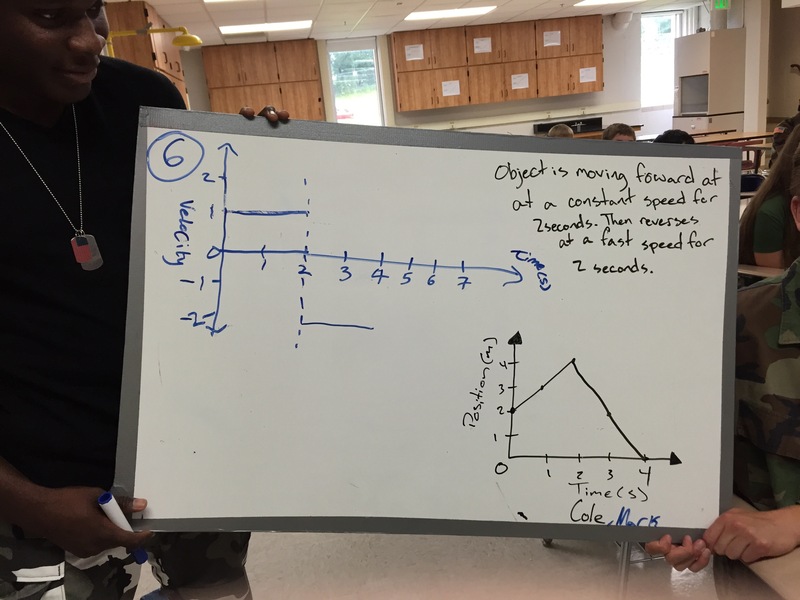 Students played Kelly O’Shea’s mistakes game using some representations of constant velocity. Students got into it and the mistakes they picked showed a lot of common errors. One group got creative with units; the problem didn’t specify, so they decided to use liters per second, explaining that the object was traveling over a body of water with a constant depth. There’s some room to improve on the questions students were asking, but I had a lot of students very willing to speak up and I’m sure they’ll rise to the challenge if I make it a priority.